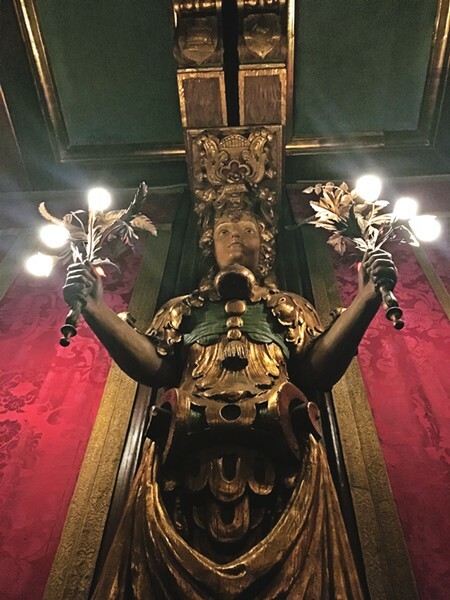 Take a partial tour of Hearst Castle for $25, which gets you a bus ride up the enchanted hill, an hour-long guided walk through some of the rooms, and time to roam around the outside of the property. For more info, visit hearstcastle.org. 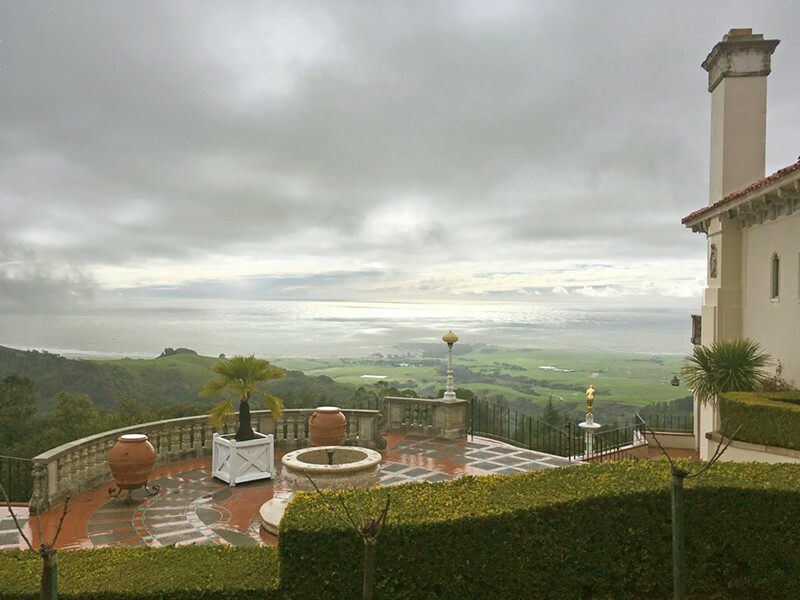 Wet and windy with an icy chill, the clouds part for a few moments so we can see the Pacific Ocean from this enchanted hilltop above San Simeon. A stormy sun peers through the far away gray. Neon green pastures, naked winter oaks, and the shine of angry water. I turn around to face four Egyptian sculptures that are thousands of years old surrounded by steps tiled with intricately painted art deco lotus leaves. These ancient artifacts have been pounded by California's salty sea breeze, wind-swept rain, and sun for several decades, which is weird. I've lived on the Central Coast for six years, and this is my first visit to SLO County's castle on a hill. It's a little surreal. THROUGH THE MIST Although the view was shrouded with clouds on Feb. 3, we did get a glimpse of the Pacific as we headed up from the Neptune Pool and to the Egyptian statues. My friend and I headed north during a break in the rain on Feb. 3, hoping it would hold as we wandered around the state's only castle on the grand rooms tour. TROUBLED STATUES Tall stately Roman women (who got in trouble with their men) light the Hearsts' cinema room in Casa Grande. "This is ridiculous," came out of my mouth several times on our one-hour walk through history, past ancient Greek and Roman statues, Baroque tapestries, Persian mosaics, Spanish ceilings, and giant European mantel. 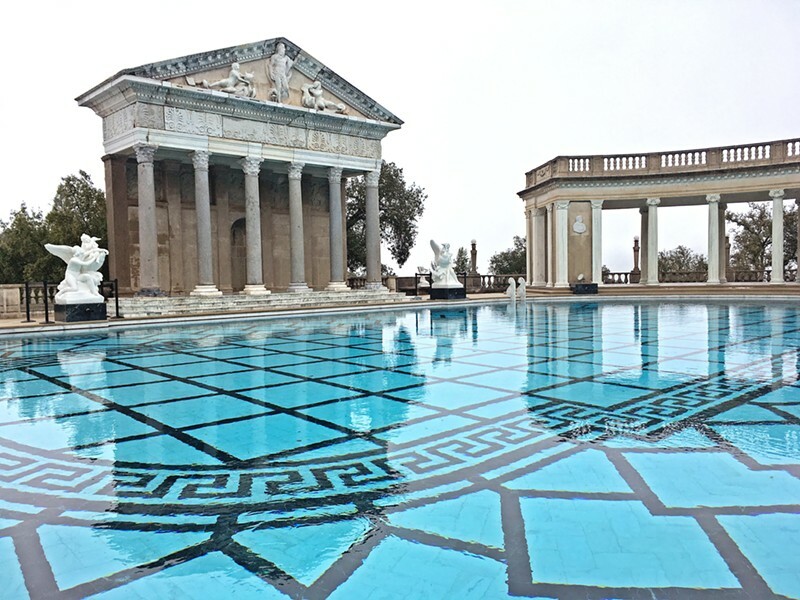 You could walk through Hearst Castle for weeks and still not see everything. ENCHANTED CASTLE The dining room in Hearst Castle's Casa Grande is a feast for the senses, looking like something straight out of a medieval castle—except for the paper napkins and the ketchup bottle, of course. 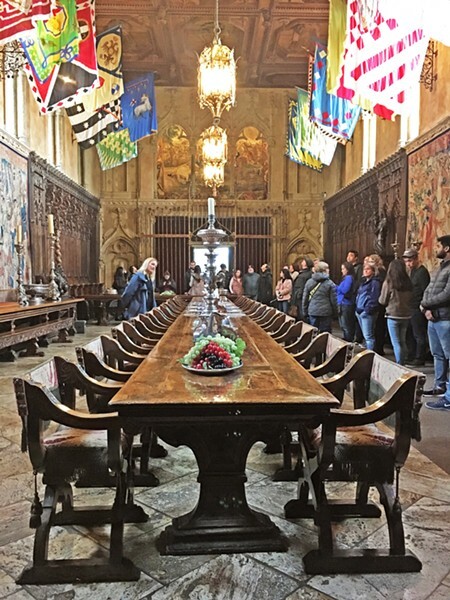 My favorite room is the dining room, a room our tour guide informed us was used as inspiration for the Hogwarts dining room in the Harry Potter movies. Four chandeliers hang from the high ceiling over a long table lined with chairs. Flags fly below the windows above. The walls are lined with church choir chairs, an odd choice, and a gigantic stone mantel sits on one end. But the inside of this place is not why I'm here. I really just wanted to see the water features, especially the Roman bath. After the tour's over, we meander back over to the Neptune Pool. Yes, I'm sure you've all seen the pictures, but imagine swimming in it, lounging around the pale blue waters during the 1940s—hopefully on a sunny day when the rain isn't beating down sideways. Swinging around the giant columns, pieced together with ancient remnants of Greco-Roman rubble. Hanging off of the white marble gods and goddesses, legs dangling in the water. BACK IN ACTION The Neptune Pool was out of commission for four years during renovation and repair of the plumbing and its leaky concrete shell, but it was refilled in August 2018. As we make our way over to the Roman Pool, we pass by an ancient marble sarcophagus, just hanging out in the garden. What is this place? It honestly doesn't make sense. A perfect mess of beautifully designed architecture, medieval century church-style gaudiness, art deco-inspired design, art museum finds, and one very rich man's vision that started as a "little something" to be built on the family ranch. FANCY PANTS Like a Roman bath, this pool is mosaic from floor to ceiling with beautiful, shiny little blue and gold tiles, and I'm daydreaming about going for a swim. Editor Camillia Lanham is swimming laps in her dreams at clanham@newtimesslo.com.